The German army Panzertruppen were never just an all-tank force. Without the support of infantry, artillery, antitank, engineers, reconnaissance, and communications units, tank formations are unable to hold ground once conquered. As part of a well-trained combined-arms team, German tanks were extremely effective in combat. During the first few years of World War II, German ground attack aircraft also played an important role in the successes enjoyed by the Panzertruppen. A number of specialized vehicles were developed to provide a reasonable amount of mobility to the non-tank units of panzer divisions. One of the best known specialized vehicles was an armored half-track designated the Mittlerer (medium) Schutzenpanzerwagen (infantry-tank-vehicle) or just Sd.Kfz 251. The designation Sd.Kfz indicated a special-purpose army vehicle. The numbers that followed gave the vehicle's ordnance number. The Sd.Kfz 251 first appeared in German army service in 1939. By the end of the war, German industry had built over 15,252 Sd.Kfz 251s. 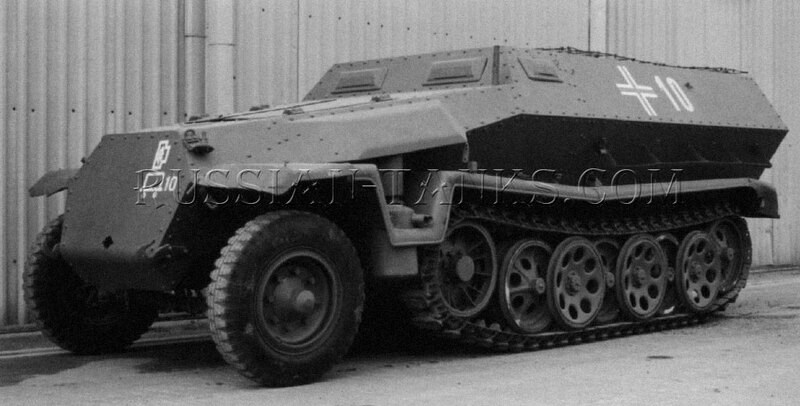 The Sd.Kfz 251 series of half-tracks came in four basic versions (Ausf A through Ausf D). These four basic models were the basis for over 22 different official variants, ranging from antiaircraft to engineering support vehicles. All versions were powered by a six-cylinder May-bach gasoline engine. The vehicle had a top road speed of 32.5 miles per hour and a maximum range of 186 miles. It was 19 feet 3 inches long, 6 feet 10.7 inches wide, and 5 feet 8.9 inches tall. The Sd.Kfz 251 was based on the chassis of an unarmored 3-ton German half-track originally designed to tow artillery pieces. 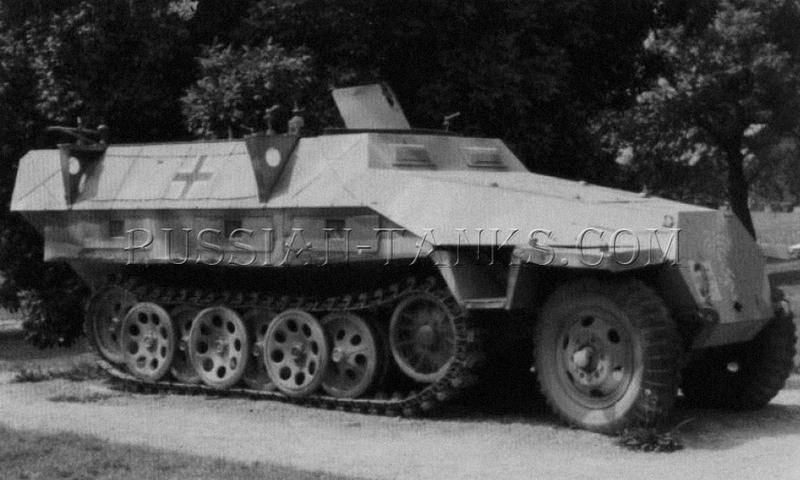 In its most common configuration, the open-topped Sd.Kfz 251 carried a crew of two (a vehicle commander and a driver) and 10 infantrymen known as Panzergrenadiers (armored infantry). In addition to the weapons carried by its onboard infantry, the vehicle normally mounted two 7.92-mm machine guns for self-protection. Due to its light armor protection of only 6- to 14.5-millimeter-thick armor steel, the Sd.Kfz 251 was very vulnerable to enemy fire and had to be employed very carefully to avoid high losses. It is the general opinion that the U.S. half-track on the whole is far superior to the German half-track. The lack of front-wheel drive reduces tractive power and makes the vehicle extremely difficult to turn in soft ground. It has been found that the German half-track throws its tracks easily on sharp turns and is inferior to our own in this respect. The German army developed a selection of Zugkraftwagens (unarmored half-track towing vehicles), originally divided into light, medium, and heavy classes. 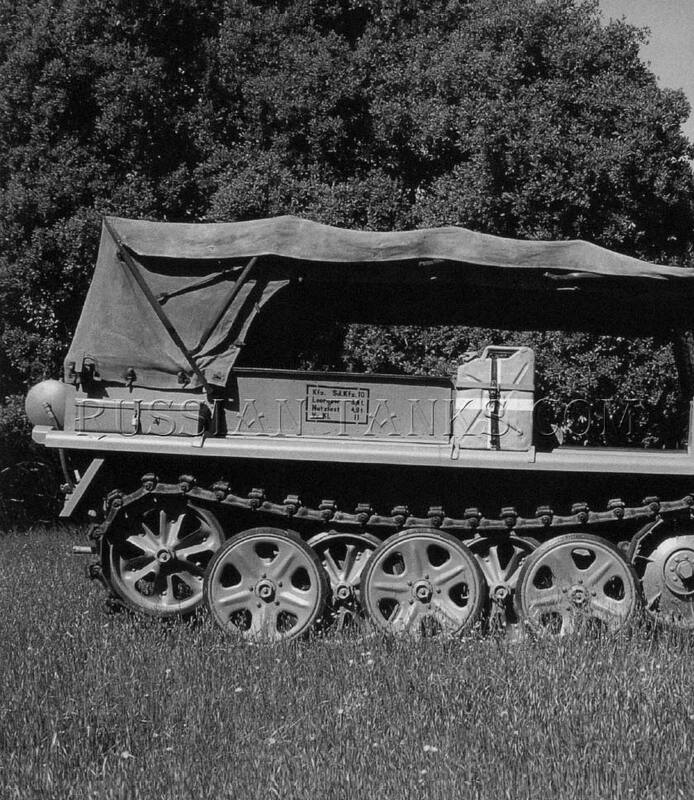 The unarmored half-tracks were later classified by the load they could carry or tow. The former light class had three different vehicles designated as the 1-ton, 3-ton, and 5-ton. The former medium class had a single 8-ton vehicle. The former heavy class had a 12-ton and an 18-ton vehicle. A 4.9-ton unarmored German half-track with a 1-ton carrying capacity first appeared in German army service in 1934. Over 17,000 examples of the vehicle were built during the war years. The vehicle was 15 feet 7 inches long, 6 feet wide, and 5 feet 4 inches high. Its main role was to tow a variety of light antitank or antiaircraft guns. Power came from a Maybach gasoline engine that yielded a top speed of 25 miles per hour. The vehicle carried a crew of eight men situated on simple bench seats.